Photographed on the Wednesday 04 September 2013. The vine weevil is commonly known as the ‘Black Vine Weevil’ and the adult is indeed matt black. 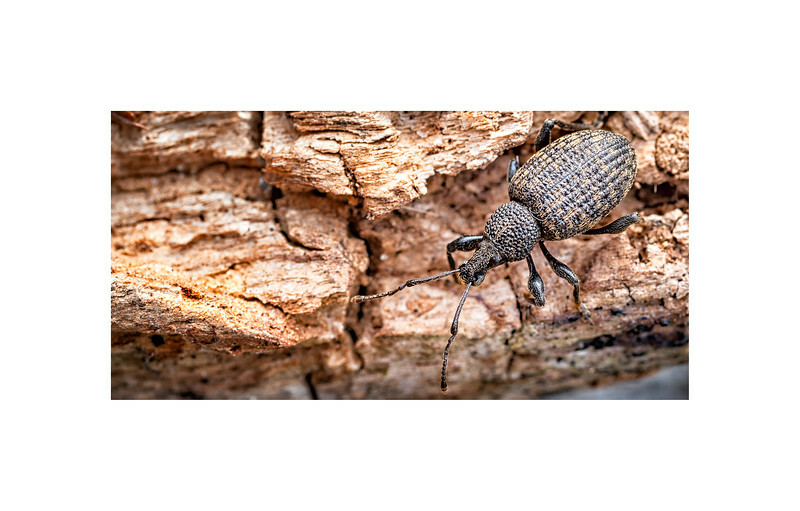 This weevil attacks both roots as a grub and leaves at night as an adult and have a wide distribution of plants that they attack. It is possible to control these insects to a degree biologically via the nematode worm such as Nemasys. Female weevils are parthenogenic i.e. via a type of parthenogenesis known as ‘Thelytoky’ where the females produce eggs without the need for males or their sperm, but require male fertilisation to produce males. Virtually all vine weevils found are female. All insects and segmented invertebrates with heads and jointed appendages come under the Phylum Arthropoda of which insects belong to the Class Insecta, which Weevils belong to in the order Coleoptera and Family Curcuilionidae. In which the vine weevil belongs to the Genus Otiorhychini and species O. sulcatus. Vine weevils should not be confused with beetles which are also in the order Coleoptera especially the ground beetle (Carabidae). Many beetles actively hunt and can also be found feeding on dead wood. This image of a weevil was taken in situ on a dead log, but was likely hiding here during the day to emerge late into the afternoon or evening.